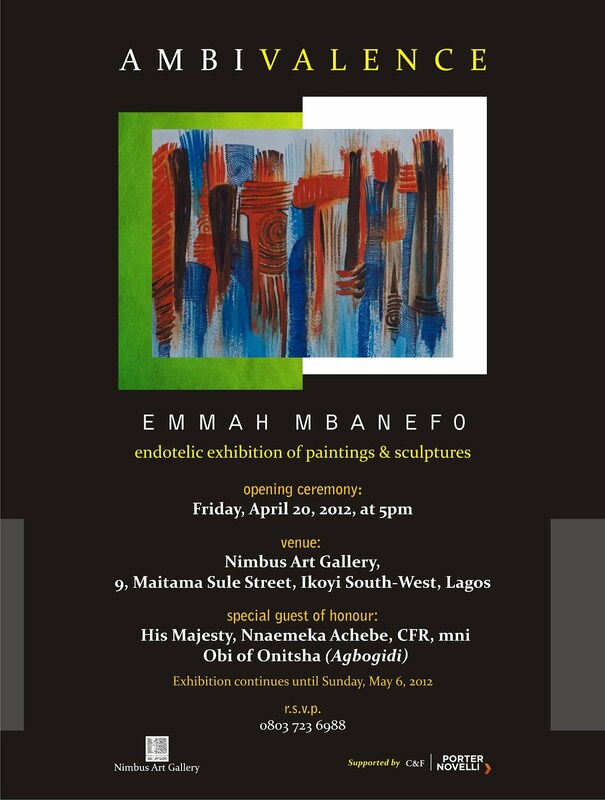 You are invited to the opening of Ambivalence: An Endotelic Exhibition of Paintings & Sculptures by Emmah Mbanefo on Friday, April 20, 2012, at Nimbus Art Gallery, 9, Maitama Sule Street,Ikoyi, Lagos (5.00 pm prompt). 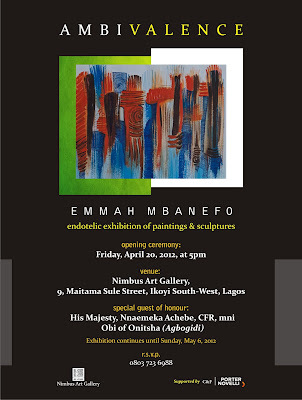 The exhibition goes on till May 2. I hope this is not an April Fool's Day prank. 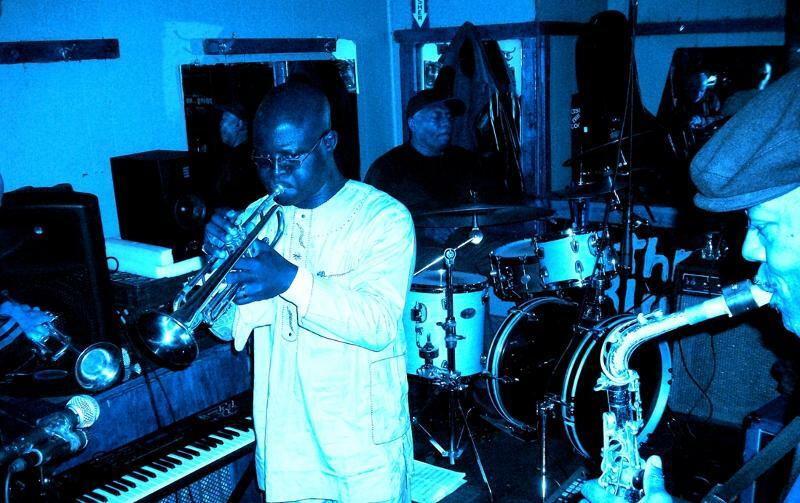 Biodun and Batik, the jazz ensemble will be playing at the Life House this Sunday. I discovered them a couple of years ago at the MUSON Jazz Festival. I thought their music was truly exciting. The group took over the hall with their big band sound. I relish the thought of listening to them again. BATIK IS BACK AT THE LIFE HOUSE THIS SUNDAY after rave reviews from their New York and Atlanta performances in November 2011. Biodun and Batik will be playing from repertoire ranging from traditional jazz to modern and some classic covers. Get paid to contribute to an open source project this summer, with mentorship from women leaders in the open source community! The Twisted project has partnered with the GNOME Outreach Program for Women and the Software Freedom Conservancy to fund an internship for one woman to spend the summer participating in and contributing to Twisted while being mentored. Twisted is an event-driven networking engine written in Python. If you love the Internet, Twisted is the project for you! This is a great opportunity to learn more about what goes on under the hood when you browse the web, send an e-mail, or use an instant messaging service, as Twisted supports all of these networking protocols. Twisted applies software development best practices like in-depth code reviews and complete unit test coverage, so it's a great way to improve your technical skills, whether you're a beginner or an expert programmer. Twisted is used by companies like Google, Apple and Lucasfilm and by many open source projects, in everything from an airline reservation system to providing dynamic monitoring of a rural electrification project in sub-Saharan Africa. You can learn about some of Twisted's users at twistedmatrix.com/trac/wiki/SuccessStories. This is a *full-time* internship open to all women, including students and non-students from anywhere on the globe. The summer stipend is USD $5000. This internship is appropriate for *any level of open source experience*. If you have worked on an open source project before, great! If not, we'll help you learn the development and communication tools we use as part of the internship. Some Python experience is a prerequisite. Please check out the full project description and apply today. From the period I learnt to read up to my teenage years, reading has always been a great love of mine. If I wasn't out, in school or doing chores, you would find me lying on my bed reading. It was my favourite thing to do in the world, followed closely by writing stories. Post-secondary school, it has been extremely difficult for me to find time to read. I know that I'm far from alone in this problem. For many years, I stuck to reading magazines for my leisure reading, because the bite-size columns and articles were the best I could manage. Had you given me anything longer than a 5-page article, I would be stuck on the second page for like ever. Not only did I find it near impossible to make out time for reading, my attention span had reduced to that of a hyper-active child and after a minute or, at best, three, my wandered off on its own trajectory. So, what to do when you really love to read and you have shelves largely full of unread books, which look so mouth-wateringly tantalising with the inviting covers and the promise of a consuming story? Well, I can't say I've mastered the art of reading as an adult yet, but I'm starting to figure out ways in which I can read more. 1. 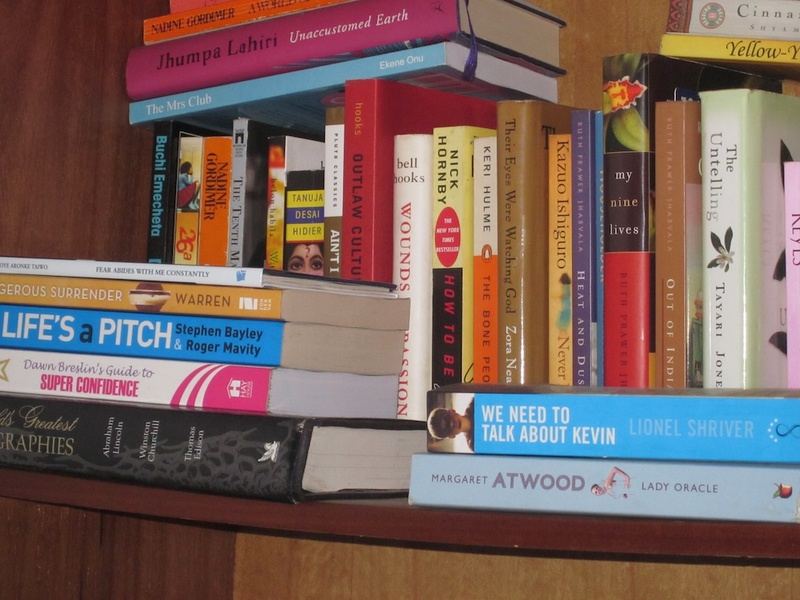 Pick books that truly interest you: While this might seem obvious, we sometimes select books that we think we should read - not because we have any interest in its themes, but because it's in fashion. A recent example for me is The Girl with the Dragon Tattoo. On a trip to New York City two years ago, I saw everyone and their dog carrying this book and its sequels everywhere I turned. I couldn't make out what the book could be about and didn't even bother to find out (I run away from fads). When I did learn that they were crime novels, I bought the first one and read it. The first third of the book was frankly hard work, but yet I persisted, because "Everyone says this is a masterpiece. Everyone can't be wrong." Well, let's just say that they were borderline. An (eventually) engaging book it was, a masterpiece it was not. A year and half after completing the book, I am yet to get through the rest of the series. 2. Explore new genres and authors: This keeps your reading life very fresh and exciting. I’ve always had some kind of rhythm to my reading. In university I read A Suitable Boy and from there embarked on a literary journey through the best (and sometimes not so great) writing from and influenced by the Indian sub-continent. I discovered some now favourites, like Anita Desai (especially her Clear Light of Day), Rohinton Mistry, Ruth Prawer Jhabvala, R.K. Narayan and Jhumpa Lahiri. Eventually, I overdosed on writing influenced by India and struggled to finish any new books. So now, I try new writers and genres as I feel like. Recent discoveries include Cormac McCarthy and Lynda LaPlante. I don’t try to read all their books in one fell swoop (although if I enjoy one, it motivates me to want to read their other books). So, I’m slowly working my way through the bibliographies of LaPlante and McCarthy, but not all at once. I intersperse their books with others. 3. At the same time, know what you like: This may or may not apply or help you. For me, even if I’ve never read the work of a particular writer, by reading the synopsis I tend to know if I will like it or not (assuming it’s written well). I generally like books by women with strong female characters and which explore issues that particularly affect women. So, chances are high that I will enjoy a book by Margaret Atwood or Chimamanda Ngozi Adichie or Doris Lessing. 4. Always carry a book with you: Amazingly, it took me years to discover that the pockets of minutes or hours I had when waiting for someone or something or in a car or bus could be put to much better use than staring off into space. Since then, I’ve been able to utilize these periods more productively and inched my way through more books. 5. Don’t force yourself to get through a book that has proven to be uninteresting and uninspiring. This is similar, but not the same as the first pointer on this list. Some books will require you to push through, before they yield any payoffs. However, with others, the dullness or pomposity of the writing never lets up. I used to believe that once I started a book, I needed to see it through. Now I say: Cut your losses and move on to something else. Life is too short! Bear in mind that for various reasons, some books just might not appeal or resonate with you at a particular point in time. Then you pick them up later and you think: Fantastic book! What took me so long to finish this gem? This was the case with me with Lionel Shriver’s The Post-Birthday World. I struggled with the early chapters with a commensurate amount of huffing and puffing. After carrying it around for a few months, I put it aside. About 2 years later, I picked it up and loved it! 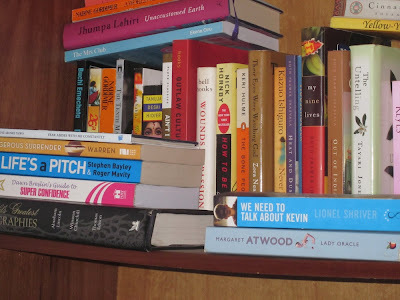 After that, I looked for every Lionel Shriver book I could find. Different things work for each of us. For some of us, it helps to keep to some kind of rules to force us to read (maybe those of us who are easily lured by other media and work). For others, these rules are just too much and take away from the pleasure of reading. So I say, do what works for you, whatever that might be. CNN's Becky Anderson talks to the filmmaker documenting Ian Thorpe's return to the pool and competitive swimming. This is probably of more interest to me now having just read about Dara Torres' swimming comeback. It's hard to return to a sport where you used to be champion and now you're regarded as a dinosaur. The annual i-Represent International Documentary Film Festival, a festival dedicated to promoting awareness about the power of documentary films holds from March 22 to 25, at Terra Kulture, Lagos from 10am each day. The theme for this year's festival is Democracy and Culture: The Documentary Film Intervention. For four days, participants and speakers will explore the theme, looking at participatory democracy and demonstrations, and new media. Get more details at www.irepfilmfestival.com. 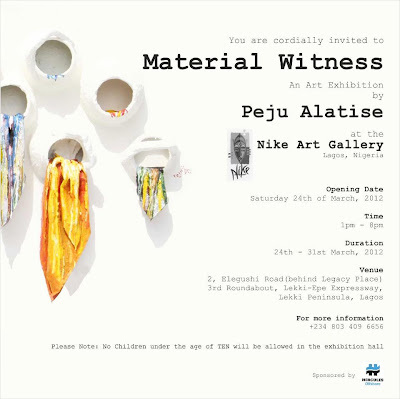 If you've never been to the Nike Art Gallery in Lekki, this is a good time to go. 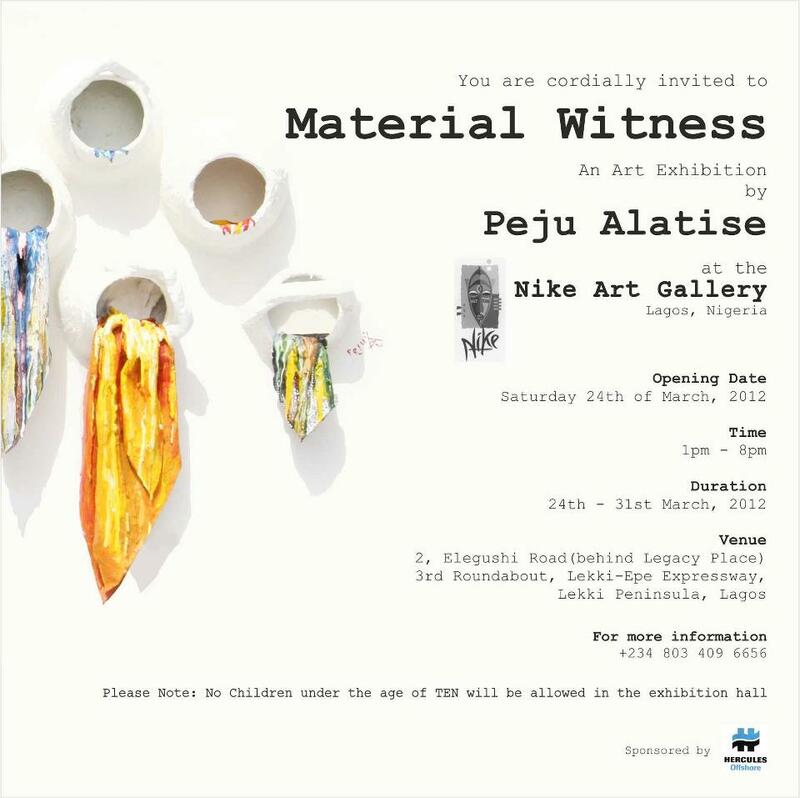 The artist Peju Alatishe has an exhibition there from March 24 to 31. Nike Art Gallery is located at the 3rd roundabout on the Lekki-Epe Expressway, at 2 Elegushi Road. I've been to the gallery just once and it was an overwhelming experience for me, because I tried to take in everything the gallery had to offer in one fell swoop. You can't do that and appreciate all the art work there, simply because there is just so much art. I recommend seeing bits at a time. Nokterra Auction House announces Auction of 101 Original Works. There's a preview dinner from March 16th to the 25th at 5PM. Call 0803.307.4428 to RSVP or check tribesartafrica.com for more information. Now remember I read the poem Phenomenal Woman at Life House during their Women Rule event? Well, I discovered this poem If by Rudyard Kipling that night and my first thought was: I know this poem! I didn't, as it turned out. I only recognised the first line from the song Inherit the Wind by Wilton Felder. I love the sentiments expressed in the poem. Patabah Books presents a book reading with Otunba Olufemi Ogunsanwo. He will be reading from and signing his books Obafemi Awolowo – Unfinished Greatness and General Yakubu Gowon – The Supreme Commander. The author, Olufemi Ogunsanwo, was head of the political desk and chief political correspondent of the Daily Times of Nigeria between 1977 and 1979 and editor of Times International at the same newspaper till 1982 when he retired from professional journalism. He taught briefly at the Department of Mass Communication at the University of Lagos as a part-time lecturer in 1977-8 before venturing into private business in 1983. He holds the BA and MA (philosophy, politics and economics) from Oxford. He studied journalism at Columbia University, New York where he obtained his Masters. He has also authored, The Sunday Times – the first 25 years, as well as his memoir, Baptism of Fire. In honor of International Women's Day, Facebook created a video to encourage more girls to study computer science. As part of the the National Center for Women and Information Technology's Sit With Me campaign, we asked people at Facebook to share their stories and why they believe there should be more women in technology. And then it turns out to be one of your best decisions ever! Does that sound familiar? Yes? No? So, I was wandering through a bookshop in Lagos, not really looking for anything and (everything else I said in the first paragraph………..). I took a second look at this book because the lady on the cover appeared to be standing in front of a huge swimming pool. Is this a book about swimming or does she just happen to be posing in front of a pool? I wondered. 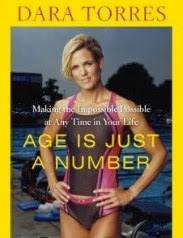 When I picked up the book, I discovered that it was by Olympian swimmer Dara Torres. The other thing you might know if you read this blog is that I love swimming. I’m not saying I’m a fantastic swimmer, but I love water and swimming very much. The other thing is that although I love swimming, I don’t actually know any swimmers. So, Dara Torres was not a familiar name to me. However, I turned to the first page and read: I’ve been old before. I was old when I was 27 and I got divorced. I was old when I was 35 and I couldn’t get pregnant. I was really old when I was 39 and my father died. But when I was 41 and I woke up in a dorm in the Olympic Village in Beijing, I didn’t feel old. I felt merely – and, yes, happily – middle-aged. A story about someone who battles the odds? Oh yes, I totally love those! And this book Age is Just a Number: Achieve Your Dreams at Any Stage in Your Life perfectly captures the experiences of having to live out your dreams in the face of naysayers and ‘conventional’ thinking that would seem to suggest that you are out of your mind for even daring to entertain the thoughts of said goal. DT, as she’s affectionately known by her friends and family, is seemingly a strong tower in the ensuing maelstrom of disbelief when she decides, as a pregnant 38 year old, to try for her 5th Olympics. I love her determination, but also her honesty when she admits to sometimes being shaken by peoples’ opinions and expectations. Wavering in the middle of difficulty is natural, but ultimately success comes from deciding what’s important to you and staying true to that. So, DT focuses on her goal and surrounds herself with the best team to help prepare her 40-something year old body for her 5th shot at Olympic glory – including her not-so secret weapon, but one which confounded even her coach at some point: her stretchers Anne and Steve. The book is organized by themes in Dara’s life, for instance On Making a Comeback, On Being an Older Athlete, On Not Giving Up, On Being a Younger Athlete and not in a strictly linear manner from her childhood to adulthood. So, sometimes it was a little confusing for me, having to get used to the constant back and forth from teenage years to adulthood pre-baby to childhood, and back to adulthood post-baby. However, the chapters build-up quite nicely to the grand finale: the Olympic Trials and then to the 2008 Beijing Olympics. I found myself speeding through the pages in anticipation of what would happen next: would she or wouldn’t she. Obviously, if you like swimming, you will enjoy this book. And if you don’t like swimming, I think you will still enjoy this book. While I really dislike the title of the book – Age is Just a Number – (I feel that this doesn’t fully capture what the book is all about), it does indicate how Dara’s story can inspire anyone at whatever stage of their life, who feels that their time to make their dreams come true has come and gone. In these pages, she shows that you can push beyond the accepted way of thinking and, with a lot of hard work and discipline, help birth your dreams into reality. I attended 2 events back-to-back at the Life House today. The first was Reel Women, a film series in celebration of International Women's Day (March 8). I believe the entire month of March at the Life House is Women's Month. So, this Saturday's film was Real Women Have Curves, which is one of my favourite films. I have watched it, I'm sure at least 50 times. Since it is a film I've seen countless times, I was initially not going to go, but decided to meet up with my friend there as she had not seen the film. Watching the same film can be different every time you see it if you are with different groups of people. And so it was today. And every time I watch it, I'm struck anew about the hard choices we have to make in life even when our loved ones do not support us. Following Reel Women, was an Open Mic evening titled Women Rule and which featured a film called Scent of the Street by director, Remi Vaughan-Richards, a photography exhibition by Lolade Cameron Cole, music by songstresses Ruby, Modele, Omolara, and Aramide. There was also some inspiring poetry and spoken word by Lala Akindoju, Tosin Otudeko and Ugoma Adegoke of Life House. Members of the audience were encouraged to read poetry and so a gentleman called Gbubemi read a lovely poem dedicated to his Mum. Before I knew what was happening, I was also asked to read a poem. It all happened so fast. What can I say? I was there to watch others and not be watched. I read Phenomenal Women by Dr. Maya Angelou, which is the modern day ode to women's power. It's ubiquity might cause many to forget how truly beautiful a poem it is and what a wonderful tribute it is to the magnificence of women.